Our Private Tours of Accademia Museum in Florence Include: Private tour guide, reservation fee and tickets to Accademia museum. Additional cost for tickets may apply for special exhibits. One of our exceptional Florence tour guides will lead a private tour of Galleria dell’ Accademia, home to some of Michelangelo’s most famous works. 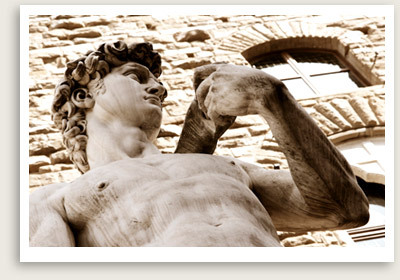 Michelangelo’s masterpiece Statue of David stood outside in front of Palazzo Vecchio since the artist’s time. In 1875, it was given a new home at Galleria dell’ Accademia during the celebration of great master’s 400th birthday. While the Accademia is still now primarily known for Michelangelo’s masterpieces, the museum’s collection also includes many gems from the Florentine Gothic, Baroque and Renaissance periods.